The many ways to find me! Leave a Comment on the Blog! 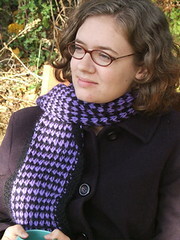 My name is Linda LaBelle – I am the owner of The Yarn Tree (http://theyarntree.com) in Brooklyn, NY. 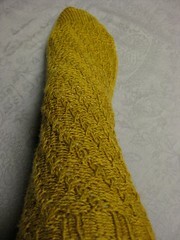 Do you like knitting socks, love working with hand dyed yarns??? 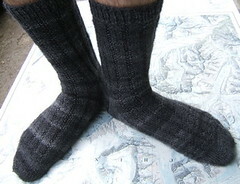 I have just started a new sock club that you might be interested in. We have six amazing guest dyers doing the yarns for the club, and six exclusive patterns! HEY!!! I’m always looking for locals. I live in the area and saw you at black sheep in the sheep to shawl. Congrats – that’s quite an endeavor. I also love black sheep and hope to someday soon buy my own wheel there. This year I purchased a few drop spindles. One Turkish – which I love but really really need to practice. 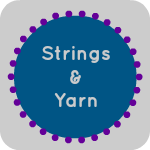 I just stumbled on your website because I was having withdrawals from BSG and needed just a little bit of yarn fix so I will definately be following up. I was doing a search for c leg and you came up. I am an amputee since 2004. I use to be real active but now am having issues with my Otto Bock 3R60. (oddly not issues with being an amputee just with the continual wearing out of my prosthetic.) The darn thing keeps failing… who knew that life was so hard on knee’s. Last night I had to tap in the bolt that holds in the stance flexion hydrolic cylinder. Anyway I digress. I am happy to see another amputee that is living life and loving it. Kudos. I use to drive through Eugene on runs while a truck driver… now (mainly due to the amputation seeing the clutch pedal is so far away) I am finishing a BS in Computer Science. …. he was ok with the surgery. I have been knitting a version of your fantastic bag that I found on Magknits and then some modifications from Liesl Gibsons blog. Now I have made some further modifications and have been asked to present a class to my guild. Originally I was going to have everyone go to both sites and print out the pattern and modifications but now that I have made more changes I am thinking I will just retype the whole thing and give credit to you, Mags, and Liesl so that everything will be less confusing but I do want to get your advice and permission first. 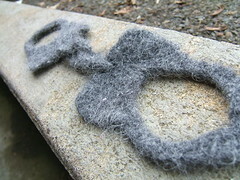 1- start with a purl row to make the pattern beginning and end similar. 2- to add one st at beginning and end of each row for easier seaming. 3- to pick up all the way across the top, knit one row and then cast off 5 stitches at each end before continuing on for the straps. 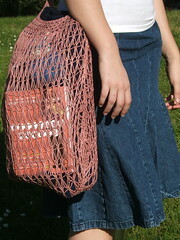 I’m trying to get hold of the string bag that was first mentioned by Liesl some time ago – I don’t knit. Does anyone make them that you could put me in touch with. I love her version.